Sister Mary Corita, as Kent was also known, uses LIFE magazine (above) to hone her students’ visual-design skills, circa 1965. Warhol’s work, Kent said later, changed the way she saw everything. 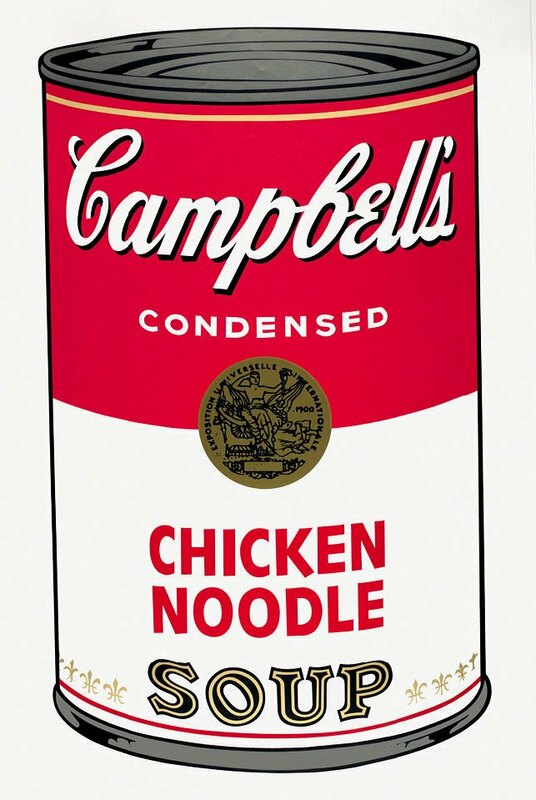 In 1964, she created a screenprint in response to Warhol’s soup cans titled, after a Del Monte Foods slogan, the juiciest tomato of all. This print, graphically powerful even from a distance, includes in a cursive hand too small to read from afar the provocative phrase, “Mary mother is the juiciest tomato of all.” The work kicked off a decade of Pop art-making, Dackerman adds. 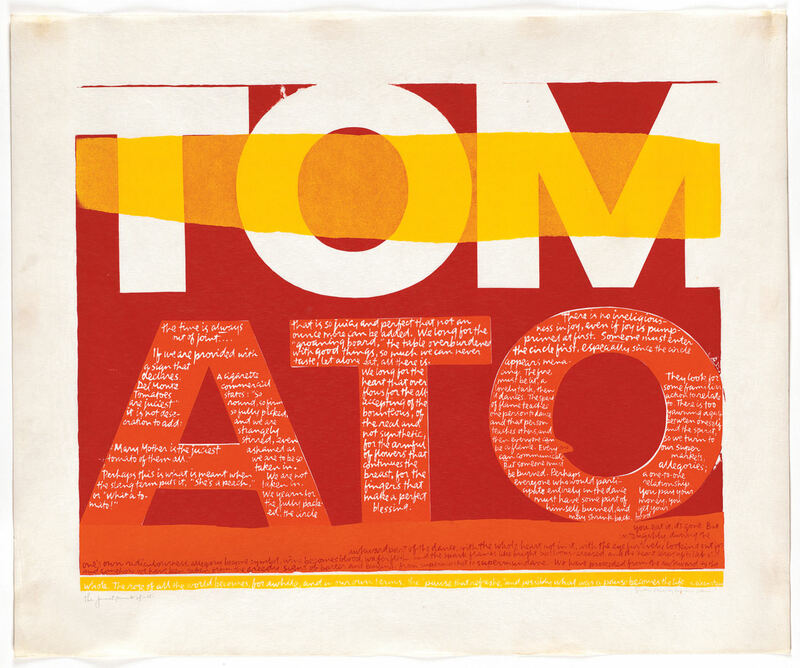 The former Weyerhaeuser curator of prints at the Harvard Art Museums has now, as a consulting curator, arranged an exhibition—Corita Kent and the Language of Pop—that will open September 3 at the museums. After Kent’s death in 1986, her papers went to the Schlesinger Library at Radcliffe, and in 2005 the art museums bought a group of 70 of Kent’s prints, aiming to make Harvard the site for scholarly investigation of her work and its place in the Pop art movement. Interest in her work has grown recently: a retrospective organized by the Tang Museum at Skidmore is traveling now, and “edgy New York and L.A. artists such as Julie Ault and Aaron Rose have revived it in many ways,” Dackerman explains. In her 1967 work handle with care (above; click arrow at right to see gallery for detail), Kent layered slogans—including words from a button and from a Chevrolet ad (“See the man who can save you the most”)—so that reading them “becomes an act of mental and physical calisthenics, that calls for slow rigorous scrutiny,” says curator Susan Dackerman. Kent also began experimenting with fluorescent inks, likely inspired by the color experimentation and theories of fellow artist Josef Albers ; his screenprint of layered squares, Wide Light; Tenuous; Full (1962) also appears in the gallery. In this detail from handle with care, Kent has written "There is only one man" in the ascender of the letter T.
Kent took the title and theme of handle with care from a slogan reproduced on a button. In her 1967 print bell brand, Kent adopts the vivid packaging color combinations and catchy jingles ("Happiness is a thing called fiestas"; and "Why not put a little snap in your life?") of a supermarket product to "modernize and make accessible the language, imagery, and practices of the church," writes doctoral student Eva Payne in the catalog. Kent took the text in the leftmost bell—“would it embarrass you very much…if I were to tell you that I love you”—from The Nazz, a 1950s performance piece retelling the life of Jesus. The logo of Bell Brands snack foods. Over time, Kent developed a rich Pop art iconography for the depiction of Catholic subjects. In bell brand, the colors, words, and logo (a ring of bells, from the packaging of a Southern California brand of potato chips) became the inspiration for a print intended to evoke the Eucharist. “In the most important moment in the Catholic Mass, the moment of transubstantiation when the bread and wine are turned into the body and blood of Christ,” explains Dackerman, “the priest rings a bell. In some places, he rings a ring of bells.” Kent’s print thus likens communion wafers to potato chips, suggesting that “the divine can be present anywhere”: even in a potato chip. Sparks flew. Although Kent’s aspirations for her work aligned with the liberalizing aims of Vatican II, “the ambitions of Vatican II didn’t really come to pass in the 1960s,” says Dackerman. In Los Angeles, “the archdiocese was outraged.” Kent and the convent came under pressure. In 1968, exhausted by the criticism, and perhaps dispirited that the goals of Vatican II hadn’t come to pass, Kent moved to Boston, where she had friends and connections to a gallery that exhibited her work. There, in 1971, she gave her new city its most famous Pop art landmark, familiar to any Boston native: the rainbow mural on an enormous natural-gas holding tank visible from the city’s Southeast Expressway, painted in swaths of primary and secondary colors. Kent lived in the shadow of the decaying 1923 Hollywood sign, and saw how Pop artist Ed Ruscha had reimagined the decaying eyesore in his 1968 screenprint, Hollywood. In 1971, Kent's Boston Gas Tank (Rainbow Tank) transformed a colossal industrial form into a much-loved landmark. Using the Pop art palette of primary and secondary colors, Kent painted bright stripes onto a seven-inch-high model provided by Boston Gas; sign-painters then transferred the design onto the tank. When the tank was replaced in the 1990s, a public outcry led to restoration of the mural. Roy Lichtenstein’s satirical 1965 work Brushstroke likely inspired Kent’s overt homage to the mechanics of art-making. Clearly, Kent’s art was in profound dialogue with that of other Pop artists in the 1960s, the curator declares—but Kent herself had no personal connections with any of her peers. 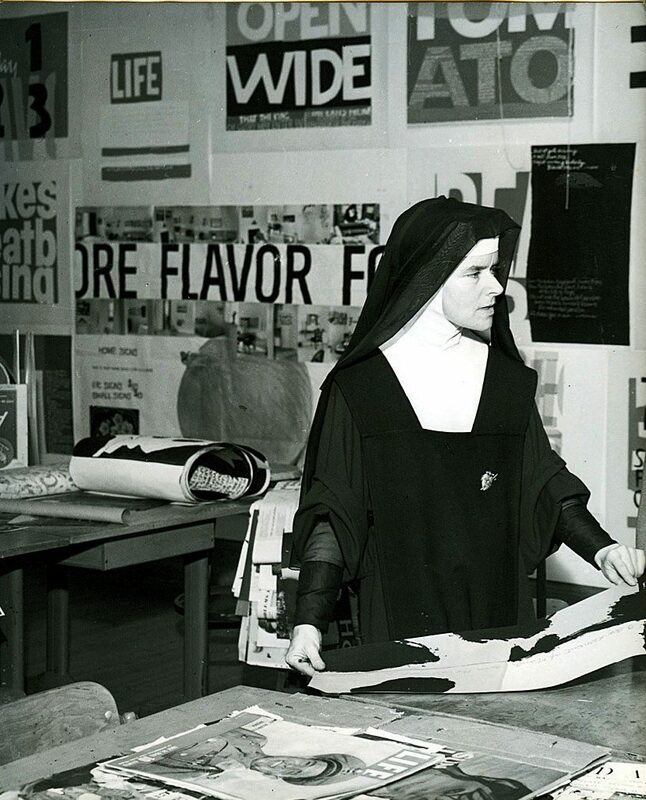 Warhol sometimes went to her openings, and Ruscha, whose studio was nearby, told his students to go to print sales at the convent, but “Corita Kent in her habit couldn’t very well go hang out at The Factory with Warhol. There wasn’t really room in Pop art’s macho style for women artists.” The announcements for the artists who exhibited at the Ferus Gallery (they were known as “the Ferus studs”) “show them shirtless on surf­boards or sitting on motorcycles,” Dackerman explains. “You can’t put a nun in that picture and convey the same message.” But with Corita Kent and the Language of Pop, the artist’s prints finally find their place in Pop art’s pantheon. The former nun hangs with Warhol. The Harvard Art Museums will host a panel discussion, lectures, films, screenprinting workshops, and other events in conjunction with Corita Kent and the Language of Pop. The exhibit runs from September 3 to January 3, 2016, before traveling to the San Antonio Museum of Art. For details, see harvardartmuseums.org/visit/calendar. This text was updated September 3, 2015, to reflect information provided by the director of the Corita Art Center and confirmed by art historian Susan Dackerman. Kent entered her order in 1936, not 1938. She taught at Immaculate Heart College; her order was called the Immaculate Heart of Mary. The surname of artist Aaron Rose was incorrectly given as "Ross."